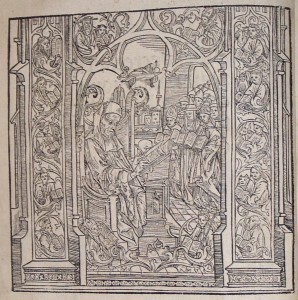 Woodcut of Bishop Ivo of Chartres at work. A legion of religious figures distinguished by their headgear appears at Ivo’s doorway bearing volumes of canon law for his use. Ivo, Bishop of Chartres, had to be diplomatic in his interactions. He held a highly visible position in the Catholic Church at a time when kings, powerful lords, and equally powerful church leaders jockeyed for leadership in the late eleventh and early twelfth centuries. Yet he also had to be true to his belief in the importance of the reforms promoted by Gregory VII and, consequently, often found his life in peril. Indeed, his opposition to the decision of Philip I of France to divorce his wife, Bertha of Holland, to marry Bertrada of Montfort, led to his imprisonment for several months. Ivo (c. 1040 – 1116) is remembered today as a major figure in the history of canon law, in large part because of two collections of writings. One, a collection of his letters, reveals him as a scholar thoroughly trained in canon law and able to use it to argue successfully on behalf of church reform. Indeed, one letter to the powerful Archbishop of Lyon disagreeing with his stance in the long-running crisis known as the “Investiture Contest,” stands as one of the most important statements on the “discord of regnum and sacerdotium” and the need to limit the influence of the state on episcopal elections. The other collection, represented by an important volume held by the Law Library, comprises one of the earliest collections of the sources of canon law. It also remains something of a mystery, shrouded by the veils of time and the uncertainty of authorship from the centuries when texts were transmitted through manuscripts. Indeed, there are four overlapping collections of materials often associated with Ivo: the Decretum, the Liber Decretorum siue Panormia (also called the Panormia), Tripartita A, and Tripartita B.
Scholars have debated for centuries the order in which the collections were compiled, the relationship between them, and, indeed, whether Ivo himself was responsible for any or all of them. Of these, the Decretum and the Panormia have received the greatest attention. The Decretum is a comprehensive collection of materials comprising seventeen parts. It is sometimes considered a “storehouse” of texts, including ecclesiastical legislation, papal decrees, council materials, and even relevant secular legislation. The many internal inconsistencies of these early resources remained unresolved in this massive compilation. Indeed, there are four overlapping collections of materials often associated with Ivo: the Decretum, the Liber Decretorum siue Panormia (also called the Panormia ), Tripartita A, and Tripartita B. First leaf of the Panormia, probably the most popular and influential of Ivo’s works. The Panormia, on the other hand, comprises eight parts, and attempts to unify the doctrines of the Church. The popularity of the Panormia is evident from its appearance in many countries. 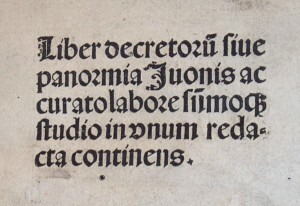 Although it eventually was replaced by the Decreta compiled by Johannes Gratian in the mid-twelfth century, the large number of manuscript copies still in existence attests to the influence of the Panormia through the centuries. 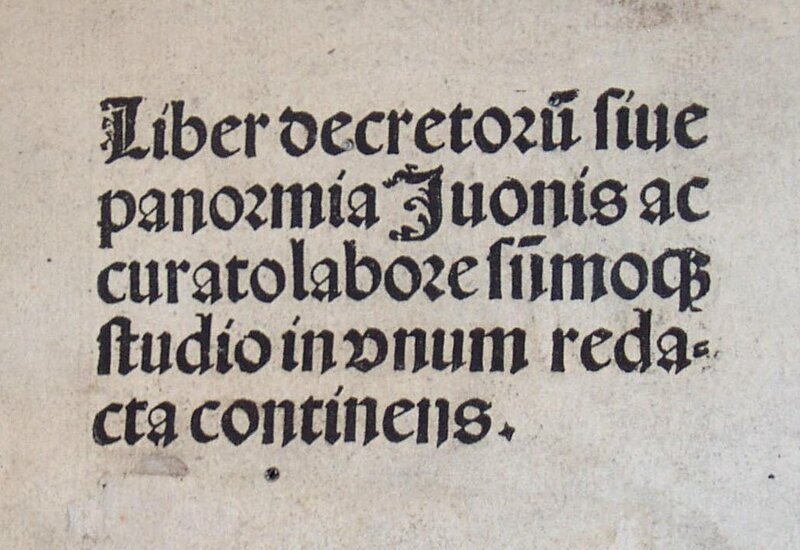 Therefore, when a copy of the first published edition of the Panormia (Basel, 1499) became available, it was seen as an important addition for the library’s rare book collection. While this collection of canon law sources would, by itself, be of major research value, scholars have come to view the “Prologue” of the volume as one of the finest examples of medieval legal scholarship. Written in a period before the emergence of law schools in Europe, the “Prologue” would have been a legal compass for the day, using the sometimes discordant texts of the Church to provide guidance to a Church official using the only universal law of Europe, canon law, to make decisions. Much of the “Prologue” deals with the issue of dispensation. It discusses the instances when, as in a modern courtroom, the sources of the law could be interpreted in such a way as to be merciful in making a decision. Indeed, it is on the issue of dispensation that Ivo, as a French Bishop, could be seen as differing with many of his counterparts who believed that only the Pope could offer dispensation. His writing focused not on who could offer dispensation, but when it was appropriate to do so based on the sources of canon law. Brasington, Bruce C. Ways of Mercy: The Prologue of Ivo of Chartres. Munster : Lit Verlag, 2004. Rolker, Christof. Canon Law and the Letters of Ivo of Chartres. Cambridge : Cambridge University Press, 2010.